I was determined to give The Auditor nothing to worry about – I would show that we had understood our mistake in letting salamis leave the property, and that I keep an exemplary boning room. The Auditor seemed quite solicitous as she commenced the audit – she of course knew of The Salami Wars and appeared to have some sympathy for how we felt at the destruction of our food. The Audit was going very smoothly, paperwork all in order, the place spotless… and then she looked to the bottom of the display fridge. ‘Why are those smoked hocks in cryovac?’ she asked. ‘Um, because they keep better?’ I answered nervously. ‘But they’re ready-to-eat products, and you don’t have a Listeria Management Plan,’ she declared. Ah, crap. Bugger and gah! So they farking are. Ready-to-eat products are ‘ordinarily consumed in the same state as that in which they are sold’ according to the Australian Standard for the Hygienic Production and Transportation of Meat and Meat Products (AS 4696:2007). But PrimeSafe treats all products that have gone through a cook process (to a minimum of 65C for a minimum of 10 minutes) as RTE. And you can’t cryovac RTE products in Victoria without a Listeria Management Plan in place. Such a plan requires monthly listeria testing and quarterly testing of every product in its package exactly as it will be sold. What does that mean in practice? Say we sell whole hams at Christmas, and sliced and half hams the rest of the year (in addition to sliced pastrami and other RTE products). We have to send off five whole packages per quarter of each product: five whole hams, five half hams, and five packages of sliced ham. The lab tests for listeria and then throws the meat away. We only do whole hams at Christmas, and we only do about 40 of them. But this requirement would mean I would have to send five of those to be tested and disposed of. That’s 12.5% of our hams thrown away. Or about $1000 in product, just for the whole hams. So to vac pack our RTE products would, we’ve estimated, cost us around $5000 per annum in testing and sacrificed product. Cost aside, we cannot stomach the idea of all that wasted food, especially from animals we’ve raised so mindfully and whose lives we’ve taken for the sole purpose of food. What total disrespect to simply throw that meat away. And so we’ve opted not to pursue vac packing our RTE products. It means we have to run a tighter production model (we glad wrap our hams and hocks), but if that’s what it takes to respect the lives we take then it’s what we will continue to do. PrimeSafe considers smoked hocks to be RTE products, meaning we can’t vac pack them. Bacon, interestingly, has an exemption from the RTE rule – you are allowed to vac pack bacon because, as both The Auditor and The Inspector have told me, ‘culturally, Australians cook bacon’. Smoked hocks don’t have this exemption for reasons beyond me, in spite of the clear cultural evidence that Australians cook smoked hocks (ham & pea soup, anyone?). And so when The Auditor asked why I’d vac packed my hocks, it was because she was about to slap me with a ‘critical’, my first. Following procedure when a ‘critical’ is identified during an audit, The Auditor rang PrimeSafe. She spoke with The Inspector, and then handed the phone to me. 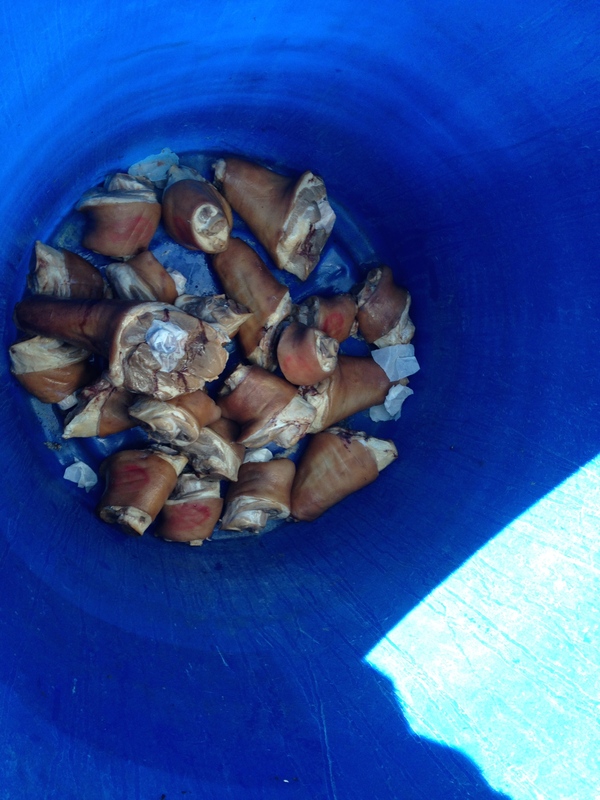 The Inspector explained that The Auditor was going to have to condemn my smoked hocks – that is, make me pull them out of their plastic, put them into a bin, and pour poison over them. Déjà vu? I asked whether we could have them tested? I asked whether I could take them into my house for us to use? I asked whether I could feed them to our dogs? And so, weeping quietly, I pulled around 15 smoked hocks out of the fridge, cut the plastic off them, and put them into the same bin our salamis were poisoned in just a couple months earlier. The Auditor asked me to get the disinfectant I clean the floor with and poured it over the top of the hocks. She then explained to me that PrimeSafe would put us on an Intensified Audit Schedule. Typically after a ‘critical’ a shop will go on intensified audits for a minimum of four audits. That means an audit per week for a minimum of four weeks, at our expense (our audits average $350-$550 per audit). Apparently the perverse incentive of this cost-recovery model to find a critical is lost on PrimeSafe and indeed the Victorian government? Who decides what is and isn’t treated as a RTE product? Is there really a need to put a shop on intensified audits for a mistake such as mine? The rest of the audit found absolutely nothing wrong. Felix Gamze of Gamze Smokehouse in Wangaratta has been a great mentor and friend to us as we’ve navigated Victoria’s difficult regulatory terrain. He’s been a butcher for nearly 30 years, and has had his own negative experiences with PrimeSafe. Felix shared the story below with me for The Regulation Diaries as he’s as committed as we are to seeking changes in the current situation to make it better for Victoria’s meat industry to do what we do. In 2008 the Listeria guidelines came into place, effectively introducing guidelines and restrictions that forced 90% of butchers to stop making ham, bacon and smallgoods in their retail butcher shops in Victoria (something they had been doing for ever). 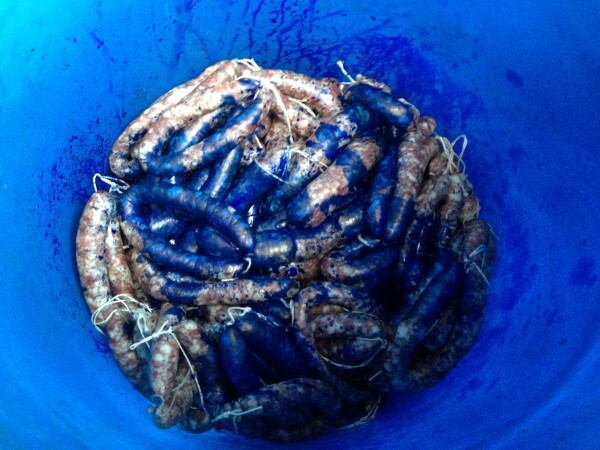 I was one of the very few to persist with making my own smallgoods due to the passion I have for charcuterie. Not long after the new guidelines came into place our industry body put on an information evening in the local area and all the butchers from the region who were interested in continuing to make smallgoods attended. Now let’s be honest, the room consisted of middle-aged butchers whose formal academic education averaged about form 4. This group of people were trained and very experienced in butchery, smallgoods making, food safety and running a small business. The information session took about 2 hours and at the end we were all expected to fully understand and implement the new guidelines in our businesses! This was not the case and many of us left not fully understanding our new responsibilities. The new guidelines just put another job on the ever-growing requirements of a small business owner. The larger manufacturers didn’t have the same concern as they would now just employ another staff member to cover the area full time. A lot of the guidelines focused on food safety, something we were all very aware of and complied with for many years without a formal set of guidelines. But another large part was the introduction was copious amounts of paperwork, laboratory testing, and bureaucracy all of which were poorly explained, implemented and set out, not to mention very costly. It was clear that what Prime Safe was looking to do was to stop the small local butcher making and selling smallgoods, something that the big guys in the industry were obviously very happy about. Soon after the information evening I had my first audit under the new guidelines and it wasn’t a very pleasant experience. At my first attempt I didn’t correctly complete the paper work required and the auditor failed me. I had a visit from Prime Safe the next day. During the visit from Prime Safe they destroyed all my products buy pouring bleach on it and took my cooking licence off me for 2 years! Now, this was not due to any food safety issues, it was purely a paperwork non-compliance issue. From that point I could have easily given up and stopped what I loved doing, but that’s what they wanted me and every other butcher in Victoria to do. After two years of jumping through every hoop they put in front of me I managed to get my licence back and start making smallgoods again. I was then asked to give evidence in the 2013 State Government Inquiry into the Impact of Food Safety Regulation on Farms and Other Businesses where I shared my experience with Prime Safe and offered suggestions on cutting red tape. Since this enquiry there has been no recommendations taken up by Prime Safe from the Inquiry and now 2 years later they are having another review… I wonder what this will achieve. Recently we decided to run Smallgoods and Butchery Masterclasses at our new facility where I would instruct a hands-on day of butchery and salami making. Once Prime Safe got wind of this they contacted me, instructing me that I was not allowed to conduct such a class. If I wanted to continue with the classes we would need to change it to making a fresh sausage and not a salami. 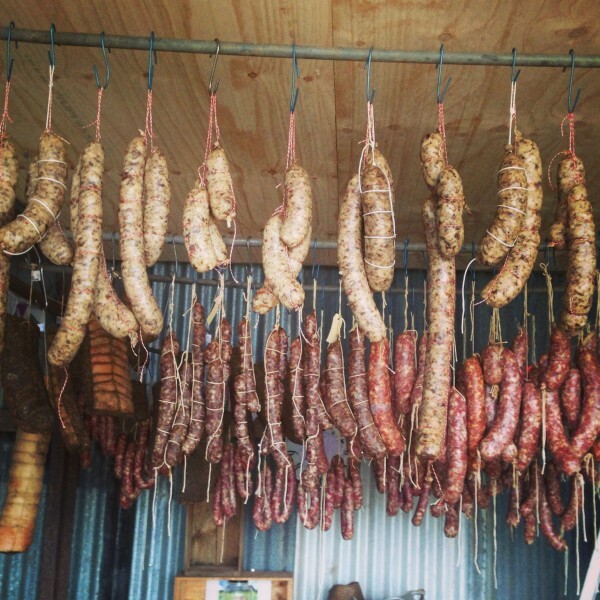 Each year I sell 100’s of kg of pork mince to local customers for them to make salami at home in June and July with some people having many years of experience and family heritage and others no idea at all. The families that have been making it for generations I have no worries about, but the average Joe that is interested in the art of charcuterie without access to a family with generations of experience I worry about. So I thought it would be a good idea to teach these people how to make salami safely and give them the knowledge to pass onto their family and start their own traditions. Obviously Prime Safe didn’t see it that way. We have run a number of these classes and the days have been a great success with butchery, smallgoods information and fresh sausage making taking place but unfortunately no salami. Maybe one day we will be able to work with our regulator and not have them trying to trip us up. I will say one thing in addition to this and that is that I am always very concerned when speaking up with regards to past experiences with Prime Safe that my licence will be put in jeopardy. My first meeting with The Inspector back in early 2013 was inauspicious to say the least. It was my first visit to PrimeSafe, but we had a month or two prior been granted a Class 3 Food Premises registration under the Food Act 1984 by our local Environmental Health Officer, which allowed us to refrigerate and sell our pre-packaged meat from the farm. We raised our pigs out on the paddocks and transported them to the abattoir an hour away. Then the carcasses were delivered to our PrimeSafe-licensed butcher, and when everything was cut and packed, we understood from our Council and our reading of the legislation that we could store and sell our meat directly from a registered premises here on the farm. It was all going swimmingly, so it was time to get our Meat Transport Vehicle (MTV) licence from PrimeSafe in order to commence deliveries to customers in the city. I was skeptical when a pig-farming mate told me my 12-volt esky would pass muster for an MTV (so long as it’s under cover and strapped to the vehicle), but upon ringing PrimeSafe they confirmed this to be the case. And so with some confidence I strode into their offices in South Melbourne to obtain my MTV licence. A rather blank young man starts to process my paperwork, and it’s all going quite well. Then I, trying to reassure him, say, ‘and don’t worry, I understand about the temperature monitoring requirements because I’ve been doing that under my Class 3 for a little while now at the farm.’ I smile reassuringly and nod. Blank young man: ‘please just wait here,’ and uses a security card to disappear behind the glass door. Uh oh. I explain that my council was very happy to give us a registration, and that they had inspected the premises and found them to meet their standards for the storage and sale of pre-packaged meat. That we have paid some $250 for this registration. The Inspector sighs dramatically at what she infers is the incompetence of councils, and wants to know ‘which council’ so she can set them straight. I ask her not to make things difficult between us and our council as we’re pioneering some new ground and they’ve been remarkably supportive. ‘I’m going to need you to write out an undertaking that you will not store or sell meat from your property without a licence,’ commands The Inspector. I’m pretty sure this is a terrible idea and I say so. I invoke my father-in-law who is a retired solicitor and say I’m pretty sure he would advise me not to do this, but that I don’t wish to seem non-compliant. So I write out the damned undertaking and sign it, still quite convinced this is a terrible idea. The Inspector takes her own deep breath and assumes a slightly less aggressive tone, makes a bit of small talk even (at which I bridle). She gathers up my undertaking and we go outside for the vehicle inspection that was the reason for my visit. Inspects the vehicle. Approves it. Shakes my hand and wishes me a good day. So now I have a licensed MTV but can no longer sell meat from my farm. Thank goodness we’d already commenced plans to build the butcher’s shop so that we could be PrimeSafe licensees, right? NB: I am currently personally aware of at least three cases of other farms who would like to sell their meat pre-packaged from a farm gate shop, but who have been told they cannot by PrimeSafe. I know of another three who are selling from farm gate shops under Class 3 Premises registrations. Importantly, we all know of hundreds of supermarkets, delis and corner shops that are selling pre-packaged meat without the requirement for a meat processing licence (even in the cases where they process meat, such as supermarkets). Explain how this is about food safety?